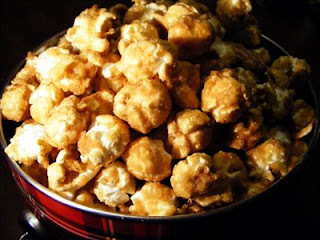 (I think this is the best caramel corn I have ever eaten.) It is always in our gift baskets we give out. My Aunt gave me this recipe when I first got married and I have made it every year since. Add first 4 ingredients to a non-stick saucepan, (You will be glad you used this when clean up comes around.) Bring mixture to a boil for 5 minutes. Remove from heat and add soda, stir quickly and smoothly. Mixture will foam up after soda is added. Pour over popcorn and pecans, stir to coat evenly. Popcorn and pecans should be in a large roasting pan. Makes for easier stirring. Place in 250’ oven for 1 hour. Stir popcorn every 15 minutes. Cool completely and store in an airtight container. This is so buttery and good! Special note: I use parchment paper in the bottom of my roasting pan. Sure makes clean up a lot easier.